here is my home-made kit of ATmega32 microcontroller interfacing. The ATmega32 controller is rich with features like onboard 32kB in-System programmable flash, 1 KB EEPROM, 2KB SRAM, 10bit ADC (8 channel), SPI bus inteface, TWI (compatible with I2C bus) interface, an USART, analog comparator, etc. That's why I've selected it to load my kit with all those features. This M32 card is having an LCD inteface with contrast adjustment, an RS232 port for connecting with PC, a connector for 8 analog voltage inputs to measure by ADC, a Real Time Clock IC DS1307 from maxim with battery back-up, four general purpose keys, two keys for generating interrupts and an LED. The circuit can be powered by an easily available 12v DC adapter. The voltage regulator IC 7805 used to convert the input into regulated 5v supply. 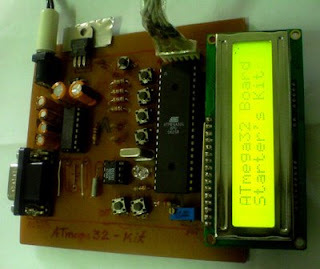 The software for the ATmega32 controller is written using imageCraft AVR compiler. 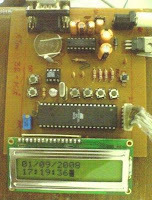 The software contains code for LCD interface, use of RTC and communication with PC with RS232 port. Using the Hyper terminal in windows, the functionality of the kit can be checked, as I've mentioned in my previous post of RTC_EEPROM interface with ATmega128. The complete source code files including new addition of ADC (check out Here) can be downloaded below. Wonderful work keep it up! I'll be sending you the schematic and pcb layout files along with the PDFs on your mail. Could you direct me to where i can buy the pcb and chemicals in chennai. PCBs (or Copper Plates) are available in Ritchie Street vendors of electronics components. I didn't buy the etchant from Chennai, but for getting it, visit any chemical shop which supplies chemicals to school and college laboratories, normally they have it, and seeing the number of schools and colleges here, I'm sure there will be plenty of them here!! I've sent the pcb files on your mail id. Check it out. Thanks! I've sent the files to your id. try it out! Firstly, I want to thank you for sharing your views and ideas its really very interesting to work on ..I have knowledge on PCB etching..Even i want to try out this starter kit. can you please mail me schematic and PCB layout and some related documents to my mail id: m.sonyjoice@gmail.com, and also can you please send me the source code using CodeVisionAVR as I'm not comfortable in using ICCAVR. I've sent you the pcb files and the source code in ICCAVR format. Also, I've sent you the ADC project files converted into CodeVision to show that it's really easy to port code from ICCAVR to CodeVision. You can check it out and try to convert the m32 board source code. If any problem, you can ask here. This is actually exactly what I have been looking for. I am planning to connect a SHT11-Sensor from Sensirion and build a raptile-tank-controller. Could you please send me the schematic and the layout-file? I've sent you the pcb files. Hi Dharmani. I've just started working with ATmega 32. Could you please send me the schematic and the layout-file? Beforehand thank you very much. im new in this thing n my lect asignt me a project using ATmega16,keypad(with LCD),SD(storage)..
sorry for the delay guys, I've sent you the files. I'v sent you pdf and eagle files., as the pcb is having three jumper wires (due to single layer), which are visible only in the eagle layout file. Hi pearl, i've sent you the files! check them out! Hi PeetTong, I've sent u the files! I am vinod .. i m making caller ID using IC 89c2051,CM8870 & comprator circuit.....sir plz semd me souce code. i am vinod patil,yesterday i received source code for caller ID. so, i want to say thank you very much for your reply. sir, i also need souce code for LCD interfacing to IC89c51. kindly request to plz send me this souce code also. so far I've not applied solder mask or tinning on my pcb. I directly solder on the copper pads. Though I haven't faced any problem ,I'd too like to apply them for giving a professional look to PCB. But right now I'm not able to get them in my local market. Whenever I try it successfully, I'll put it up on the blog! find the files in your mail!! but can i gt details on for atmega8 huh... how to make homemade kit for this to program for my robotics projets..
u hv done great job... dear i m working on Atmega32 interface with parallel port using pong prog... can u send me files that tell me how to bais Atmega 32 and how its interfacing works..
For understanding the atmega32 interfacing, the best document is the datasheet!! Just go thru it once, you'll get a better picture! My name is Anbe. I've just started working with Atmega mcu. ( Only on test boad). I really want to make a real project - my first project too. Can you give me this schematic, pcb layout and the code C, please??? Thank you very much for this help. coul you plz send me the schematic file by mail or what? To mehran: I've just send you the enlarged view image of the schematic. Nice idea and very useful. I'm trying to make phoenix-hexapod-like project :). Can you please send me the component list (part numbers) for your project? i wANT THE CONTROLLER TO ENTER POWER DOWN MODE AND WAKE UP AND RECORD THE DATE AND TIME WHENEVER SOMEONE PRESSES A KEY. Hello there, same request please. Could you send the project related files to wat3rfall2003 (at) yahoo.co.uk ? Thank you very much. Any chance one could interface another LCD than the one stated? I was thinking I have a broken Sony CDX-GT20 with the LCD and front panel intact. I also have the service manual for the CDX-GT2XX series. i, Gud Work, Could you please tell me what tool you use to generate the schematic. Awesome work ...thank you very much for posting your work. can u plz send me schematic and layout files for the this project. Meanwhile, I am trying to make a controller/driver for a 2 axis cnc which is like making holes every 0.5 mm on a 3x4 meter surface. Which needs like 100 meg of ram to hold the pattern! How can I add that ram to this board also to include L297 & L298 for the PWM part utilizing 6 wire stepper motors. BTW, I already have a board(which I purchased $40) that is very similar to yours only it also has a L298 in addition to the ATMEGA32L PU8, a 4x4 keyboard a small Stepper attached and rs232 + a relay etc. I can send you a pic of the front and the rear if you like? Can you tell me how to change it's program so it would interface to PC utilizing my interface rather than the simple one it came with? Regarding having a huge memory in any embedded system I found the following link. Can you please explain how it could a MicroSD be interfaced with your card? It says an SPI can be utilized but yours has 6 pin and this needs 7? would it be a big change in code if we want to display options on lcd and not on hyperterminal???? As I live in Australia, can you please provide me with compatible parts list(also schematics) for creating Atmega32 LCD kit, i would first create it in a breadboard system ,before transferring it to PCB. Also I have a Jaycar (local electronics supplier) kit (AVR ISP serial programmer). Would it be possible for me to use that to program the Atmega32? (it says it can program atmega32).Also could you please provide me with the C+ code for the AVR compiler(is that code compatible with all Atmel Compilers?). Also, is ot possible to use bigger character LCD for this project? Also one last thing!, could you please put up the project of programming graphical LCD (bigger screen with colour graphics). hey sir, my self Jaimin Shah. I need the schematic , eagle files n pcb layout. Hi guys, I've sent the files! Have a look at you inbox! i have already make board atmega16 with double layer pcb. My friend helped me to design the pcb, but have some problem that lcd not working and when I checked port B and Port D, have some problem that one of the header couldn't be control. I confused with the schematic that myfriend make. Could you sent me schematic and layout file for comparing with my mine. Could you please mail me the schematic of the development board and the usb programmer to me..
and dod u have any idea that how can i make the atmega 16 development board. and is there any difference between the two.. Please mail me the PCB/Schematic etc. of the development board . Hi, I enjoyed reading ur blog. I'm inspired and want to build one of my own.. I live in the US and am trying to find these parts.. Question: what kind of connector is that between the main pcb and the lcd.. (Obviously, I'm a newby, ha!) Thanks! Thanks for providing your hard work for public interest. 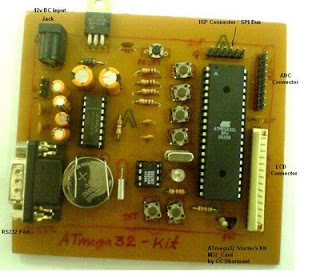 I am looking forward to build your ATMega32 Starter's Kit. I started the PCB design in Protues VSM and I can give you the file if you want to put another version of the PCB layout design. I use Keil uvision as code development platform in C. The advantage is uvision works integrated with Protues VSM and I can see the result simulated. Pls tell us the exact specifications of the R9 Pot that you have used in the development board. You can use a 3k9 or 4k7 pot for R9. It's provided for adjusting the contrast level of the LCD. I made the system (by making PCB with Proteus) and also tested the system with a blink LED program written with AVR GCC (AVRStudio4). I made a parallel programmer (stk200) using Ponyprog to program. The LED blinks ok with ATMEGA32. Then I downloaded your M32 hex file. The LCD shows 'WELCOME' in the first line and the courser blinks in the 2nd line. In the PC I get "F9 2C 3C F1 84 60 79 69 AD 29 4A 29 4A 29 2A 29 A2 2A 5A 77 08 4A FA" when I reset the processor. It responds when I press 1, 2, 3.. etc but all seems garbage. I am using Realterm 19200, 8N1, None. The terminal shows framing error. Any clue? Can you please send me the C source file in AVR GCC? That will really help. From Nic Again..another issue i forgot: It seems that DS1307 is not working. I do not see any trace of oscillation or 1Hz pulse at pin 7. Oscilloscope at the xtal pins do not show any oscillation too. Thumbs up and a standing ovation. there are lots of AVR programmers, USB, serial port or parallel port operated. If you search on net, you'll find plenty of info on them. Could you please send me a schematic and board design in eagle format. So i am not getting whether my code is burning or not... I wrote a small led blinking sample code... The code is correct bcz i got that code along with the MikroC Pro Avr compiler.. Plz help me out its very urgent for me..
when you buy a new atmega chip, it comes with default 1MHz internal oscillator enabled, you can straight away start using the chip without changing any fuse bits. But if you are using port pins which are multiplexed as JTAG pins, then you need to disable JTAG, as by default it is enabled, there you need to change fuse byte. So, if you are connecting the LED on PORTC of mega32, it may not be working due to this. You can try non-jtag port pins, if you don't want to play with fuse. Ponyprog displays message after the write & verification is successful, are you getting that message? If you are, then better check the connections again, as the code is proper as you say. We have made the ATMEGA32 board as per your design. We are getting the "WELCOME" message on the lcd after disabling jtag but we are not getting any values or message in hyper terminal after connecting it through serial port(RS232). Please suggest some methods to sort out the problem. for the RS232 communication, First of all, check that the hyper terminal is set at 19200 baud rate, no parity, flow control as 'none'. Also, make sure that the controller is running at external 16MHz crystal (by default, it will be running at 1MHz, you need to change the fuse settings to change it). Secondly, check the connections. In my schematic, I've used a male DB9 connector on the PCB. So, you need a RS232 cable with a female connector on both sides. By chance, if you have soldered a female connector on PCB, replace it with the male connector and change the cable with both the sides female connector (one connector will go to PC and the other identical connector will connect to the PCB connector). Use the 'memory erase' command in your AVR programmer software. It will erase the memory and reset all the fuses to default setting. Check the connections of the serial programmer which you are using with ponyprog, that is usually main cause, if the connections on the AVR board are correct. I have followed your advice and our avrs are workin again!! 2)when we dump d m32 hex code onto the avr,the sequnce of words in "welcome" come one after d other and go away.All the characters of welcome are displayed one after other very fast...and at end a BLINKING "!" (EXCLAMATION MARK) STAYS ON. Please advice how to get over it. i have already posting regarding my AVR board which i am using. I am ponyprog2000. when i am selecting write program memory(FLASH) i am getting "Device missing or Unknown device" and at the time when i press "write program" PA0 to PA5 leds are blinking and after the error message they are OFF. After that PA0-7 leds are blinking in asynchornous way with some delay. How can i rectify my error. Please help me out.. 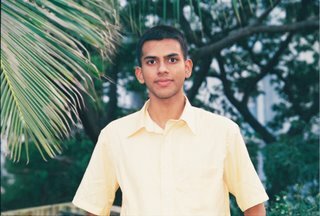 This is ankit mutha, another robotics & embedded systems enthusiast. I wish to make a similar board as this one for my college robotics club. Though this board is complete in itself I wish to add some motor drivers and some debug leds. It would be very generous of u if u could send me the schematics of this board. I would like to modify it and enhance it further and share my modifications to ur design. oh and btw i have some experience in working with eagle.. have made a handful of custom boards myself. So if you have the schematics in eagle supportable format, please send that. I am new to Atmega32, could you please send me pcb layout to print and related files for connecting a lcd,usb keyboard and external eeprom 24C64 . thanks in advance.. i would be using codevision avr for programming atmega 32 via robokits usb programmer. Was bit busy in between. 2. The serial port sends garbage when RST. Term Emulator shows "Framing Error". This can only happen when there is a Ground problem, or noise or long cable or Baud Rate mismatch. I checked all, din't find any clue. I want to test with lower baud rate. Can you send me the source file? Although I am not sure why I didn't get any reply from my earlier posts!! sorry if I didn't reply you earlier! I'm sending you the source code right away!! You can check if you have selected correct crystal (16MHz) as that can also cause baudrate mismatch. You can test with another LCD, if you have, as sometimes the LCD has that kind of defect of displaying one line only. I need some help on the PCB and schematic. Hi, glad to know that!! Best wishes! i need help am doing RFID security system using ATMEGA 32 and the sensor is coil..
i wrote the code but it didnt work so i need any circuit digram for the programing part contains mega 32, Max233 and Rs23 and i f know any software that i can simulate the this part..
Iam planning to include serial camera module(which can be interfaced with Atmega32) and stores in sd/mmc card interface. I need to know exactly how do you interface sd card with atmega 32 i.e., how do i transfer output from camera to the sd card and transfer those stored images on to my PC serially?? Can you also help me where can i get such cameras which would give a digital o/p so the interfacing with atmega32 can be done..
you can use Proteus VSM software tool which is extremely useful for debugging the AVR code on the actual schematic. Saves quite a lot of work of putting things together on real hardware. You can search on net to find more info on it. I tried to work on RTC(DS1307) using your code as reference.But i need RTC to update time every after 1 sec and to be displayed on LCD. The RTC is updating time only at power-on reset & no further update on LCD is seen.Is it possible to read RTC after every 1sec Please guide me. HI, how much does your kit cost, and is it for making r/c motors? I recommend this platform to all those who want to learn this microcontroller. Regarding the RTC; you can use the RTC_routines given in this post. Call the RTC_read function at fixed interval. Display the RTC value every time you read it, it will automatically update. For example, call it every 200ms. Wehenever time changes even by a second, the display will update when you write to LCD next time. If i want to integrate this project to the SD card project, can I ask for the codes for SD using 16Mhz? you can use the SD card code available with 16MHz crystal also, without any change. Slightly thicker traces on the PCB would be very nice. Hi!i was looking for a development board to interface and program ATMEGA32 with LCD,KEYPAD ,AND SENSORS(motion,temperature,smoke sensors). I'm trying to learn this whole interfacing thing and your help will be greatly appreciated. can u please send me the PCB layout and schematic details to my email. i am doing my project. Thanks a lot sir for sharing this project. It's very interesting and i'm building it now using ur schematic diagram. well,i am new in this uC things and just learned only using codevision AVR. could u please send me the source code in codevision AVR? it will be very helpfull. so until now i have to burn the chip and program it using superpro when i want to download acode. and this realy not good. when i see this page i understand that if i build the skematic and the download abootloder for the ATmega32 then i will can download the codes seriale .am i right ? DS1307 for what you use it? can i do not connect it? I'm very impatient to build this my first kit. Thank you very much for it. I greatly appreciate your clean intentions of sharing knowledge which is the only key to keep learning. i want to interface SD card, but i had very little idea about sd card.please help . hi, this is mahesh from hyderabad. by using a make file i dumped the code to controller. please help me.. Please tell me in what software you have made the schematic. Powerful thing! Just the one I've been looking for. Could you, please, mail the circuit diagram and pcb to ironwheal [at] gmail.com? I want to make one for myself. I see an error with the rs232 circuit: GND should connect to pin 5 instead of pin 1(DCD). the 'macros.h' & 'iom32v.h' are ICCAVR compiler specific files. So, if you are using this compiler, no error will be displayed, every other compiler will display error for those files. Use your compiler specific files. For example, if you are using avr-gcc (winAVR, AVR studio) then you can replace both those files with 'avr\io.h'. You can go thru the compilers library help & find out which file you need to include. i am really impressed by your work. I need your help for my project. 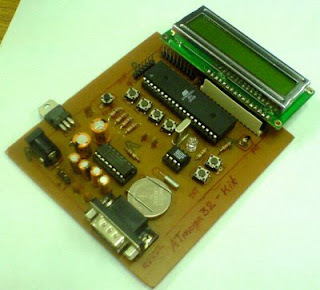 I use an Atmega32L Ucontroller and for programming i am using codevision avr c compiler software. can u please help me with codings of the color sensors( red,blue,yellow)need to sense colors and give commands to microcontroller. thanks you. By the way do you have the code for winavr or avr studio? could you please send me the files. I guess you must also include the eagle project files in the OP. I require a complete in detailed ciruit diagram and layout and also the coding for ADC interfacing since i m a student and have just been introduced to this subject..
could you please send me the sch file? me too need the pcb files. I want to build a starter kit for myself. I hope you will help me out with the schematic,the layout files and the program. Great job! Thanks a lot for sharing! this is awesome stuff, could you please send me the schematic, the layout files and the program. i m making a project with atmega 32. Cn u pls mail me schematic and pcb layout. Also mail me steps that how can i burn my program in the microcontroler. Hi - great project, can you please send the Eagle files to me - brentdbell@gmail.com - thanks in advance! i need some help for schematic and pcb layout..Can u Please E-mail it to me sir? I have checked from your website that atmega32 starterkit have also data logger for microsd. I would like to know whether this modul supported with DT AVR Low Cost Micro system(ATMEGA8535). And could you send me schematic and source code for atmega8535 for sd card? Hi. This project is fantastic. I dont suppose you could write a parts list could you. I am going to try and build this and use it as a development board to learn bout avr's. Also would it be straight forward to swap the chip for an avr mega1284? this is rekha. can we interface mpx4115a with atmega32 microcontroller.. is it working perfectly? or else any other micro controller that can be used? Well, mpx4115a has voltage output proportional to the pressure, so any microcontroller having ADC would be fine for this job, and since ATmega32 has in-built ADC, it can be used here (and if you use external ADC chip, then, any microcontroller in the world can do the job). i want to make a project in which i have to use mega 32 for connection of temperature and megnetic switch sensor to it. i want the output on lcd and loudspeakar. please send me circuit diagram idea to complete it. Check out the LCD contrast pot, as this is the single most reason for such a behavior. You can set the contrast pot to around 2k resistor for safer side. Once something is visible, you can adjust the pot for getting best contrast. Hello, can the LCD be programmable at pixel level? Want to do a snake game on it. I just got one doubt. What's the dif b/w ISP and RS 232 port? If RS232 is for serial communication ,then why is ISP needed!! May I have the code for macros.h? Thanks very much for your work! I am new to the world of AVR Microcomputer programming. I like your project very much and would like to build one of my own. I have downloaded your code and a copy of ImageCraft, Release 8.05 rev 02, but I am having a problem building the project using this tool. I am getting the following error and warning messages. Any help you can give me to resolve these issues would be greatly appreciated. If anyone is searching for the copper pcb plates they r found at ritchie street at universal electronics..
try Proteus ISIS, it's got most of the AVR controllers.